The basic rule is try it ,if it doesn't work it doesn't mean its wrong as another day it will work well, but you can fine tune as you shoot, take time to watch the birds reactions as they approach , if you have birds flaring away at the last minute, then something looks unnatural and needs changing, but not always the decoy's, it could be a movement in the hide, a flash of reflected light from glasses or flask etc, a dog moving, almost anything will spook them, As to birds flying past without looking twice at the decoys, thats something I find at this time of the year is very common, as the main flocks break up and birds start to pair off for breeding they seem to become preoccupied either by other groups of birds or going back and forth to a favourite feeding area, my son and I shot one of our regular spots today, even with 20+ dead birds out they still just flew over, we tried a flapper, floaters, lofters but nothing would pull them in, we had a few who came over close enough to get off a shot but the main bag today was crows who are very active at the moment, they were much easier to decoy in. 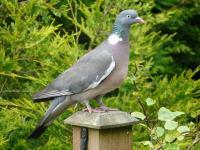 I would much rather shoot pigeon but when they are playing hard to get a few crows make a reasonable option. So dont worry too much about birds passing by , once we get into summer laid areas in standing crops or when we get into harvest time and shoot the stubble fields it all changes, you should find decoying in stubble with flappers or a magnet will get a very different response from most birds , they can become obsessed with finding a crop full of seed as they compete with other birds for any seed available. Beretta every time, I swear by my 686E and my 391 urika 2, would not consider any other make. love them. If you only rough shoot with the wild fowling through the winter then try the Beretta 391 Urika 2, multi choke, 3 shot semi, with 3 inch chamber for the geese, The pheasant and clay shooters don't like 3 shots to be used but for all other shooting they are great, will cycle almost any cartridge, without jambs, weight is about right, on pigeons and crows you have the advantage of a third shot, you can even add a silencer to the barrel which can be unscrewed to revert back to normal choke barrel when needed, Stock length is not a problem as any gunsmith will supply you with the correct spacers to lengthen, I have an extra 3/4 inch in mine , also there is an adjustment in the stock engineering to allow you to change both horizontal and vertical position to suit exactly your own needs. The build quality and finish are spot on, you can pick up a good second hand one for around 650 quid so it wont break the bank. Thanks Jdog, I couldn't find a head for my dummy and the wife refused to model it for me so I pinched the grand daughters football !!! I used to roar around the village on my Triumph tiger cub, trials version, annoying the hell out of all my parents neighbours,, The year was 1963/4. My old man got so fed up with the noise and complaints he bought me a car !! 1952 Ford Anglia, sit up and beg ,produced in black, black or black. it cost 2 pounds ten shillings and had a knocking big end, 3 forward gears with no synchro mesh to speak of,under powered side valve engine on white metal bearings , no heater or radio and absolutely the worst brakes, I spent 20 quid on parts to rebuild it, it lasted 3 months before I had to spend another 20 quid fixing a broken half shaft and rod brakes that were about 10% efficient, worst car I ever owned but I learned a lot trying to keep it on the road, I eventually sold it at a huge loss and bought a 1954 left hand drive VW beetle with a broken crank, rebuilt the engine and never looked back, by then I was a second year apprentice at the main VW agency in West Bridgeford, Nottingham, Beardall motors which was bought out by Bristol Street Motors in 1968 and as far as I know is still going under the same name. When I think of all the old banger's I kept running for mates and people who paid me, cars built between the early 50's and early 70's it makes me wince, people now don't know how lucky they are to have such an amazing choice of motors built with 21 st century technology , ABS brakes,high performance motors that go miles on an egg cup full of fuel, air con, sound systems, fuel injection, plush interior comfort,incredible built in safety, I couldn't and wouldn't go back to those old bone shakers ever, what say you?